Pick 3-4 Cheeses to serve. A general rule is 4 ounces a person but it depends on the time of day and what else you are serving with it. Vary the consistency of the cheese: a soft fresh cheese, a semi hard and a harder cheese like Parmesan. Provide three different milk types: a goat, a sheep and a cow’s milk for variety. A nice jam to serve with it would be fun, like Laura Ann’s Blackberry Bayleaf or Raspberry Habanero! Serve with fresh bread. You can also add some simple crackers or a nice crostini. Open a bottle of wine!! American: Nettle Meadow Kunik from N.Y. (a creamy blend of Goat and Jersey Cow milk), Beehive Cheese Barely Buzzed, Utah (rubbed in coffee), Beecher’s Flagsheep, WA (voted best cheese by the American Cheese Society). We have a great selection of cheeses in our store. Need a basket with fresh cheese? 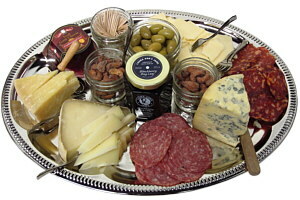 Try our Cheese 101 Gift Basket or check our Gourmet Gifts page for other delicious gifts. Need help? Come to our store or call us at 855 313 5680.